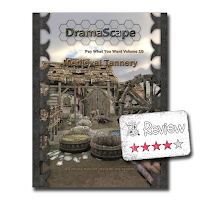 This week I decided to take another look at a DramaScape item and the Medieval Tannery just jumped out at me. I don't think I've ever seen a RPG publisher tackle a tannery and frankly the cover really pulled me in. Now I discovered the Medieval Tannery through a bit of link-hopping. While this download is PWYW, the rest of the DramaScape line, at least those with a price, range from $4-$8. This download consisted of two files, a 19 page PDF and a 100 dpi JPEG map. Altogether these files are 17.1 MB in size, unzipped. Now the PDF is completely unsecured, which normally wouldn't be that big of a deal for a download of this type, but it is for me...I'll get back to this in a bit. The map is a hair larger than 16" x 20" and it is a nice overhead shot of the whole area. Visually, the map looks like a bit of a mess, which I feel is great. Often overhead maps are a bit too clean and as an artist person with limited ability myself, I'm unable to accomplish that "lived-in" look myself. I only have one criticism when it comes to the map, and that is I wish there was a second "map" or picture that was just of the Tannery roof. As a GM I don't like showing the interior of a building until the PCs actually enter the building. In a pinch I could just black-out the interior and reveal it when appropriate, but I would rather have a a real roof. The PDF starts out with a rather detailed description of the map. The author uses cardinal directions with the assumption that the top of the map is North. I found the directions a bit cumbersome to read, but I think it would have been easier if I had the printed map in front of me to reference while I was reading. The PDF then dives right in to how to use this product with others from the DramaScape line. Completely unnecessary, but I loved this. Odds are the majority of people downloading this file are doing so for free, so this half page of info is good advertising. The rest of the PDF consists of the four-page, 16" x 20" map in three styles: squares, hexes, and no grid. I'm sure the creator could have simply made a four page map and added the grids as a layer, but I have a feeling that would have been way too big of a PITA to get the grids to line up. If you only needed one option and wanted to reduce the PDF size, I guess you could always just delete the unwanted pages. OK....I did say that the "rest" of the PDF consisted of the maps, but there is a hair bit more in the PDF's back cover. On the back cover is a short encounter set-up using this map. While I like this adventure seed, I do not like it on the back cover because the text...well it isn't text, it is a graphic. I'd like the ability to copy and paste the text if needed and you can't do that if the text is part of the back cover graphics. 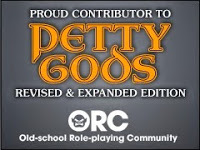 Luckily the body of the text is part of the item listing on DTRPG. Overall I really did like this download of an interesting place for any fantasy RPG. While there were a couple of minor things I'd like to see done differently, I still think the Medieval Tannery is worth a couple bucks easy.